Landing pages are valuable marketing channels that will benefit the bottom line of your business. Whether you want to grow your lists, sell products or services, or showcase your expertise through thought leadership, landing pages are a great way to nurture new customers, educate people about your products, and drive conversions. Unlike your website’s homepage—which is generally designed to provide an overview of your business—landing pages help build customer loyalty and increase profits by hyper-focusing on a specific short-term goal. When you set up landing pages for individual campaigns, audiences, events, or promotions, you must provide people with a clear, direct call to action and make it easy for them to take steps further into the buyer’s journey: Form fills, contact us, subscribe, share, and engage. The secret sauce to building high converting landing pages is a strategic construction of every element of the landing page designed for a specific demographic segment. 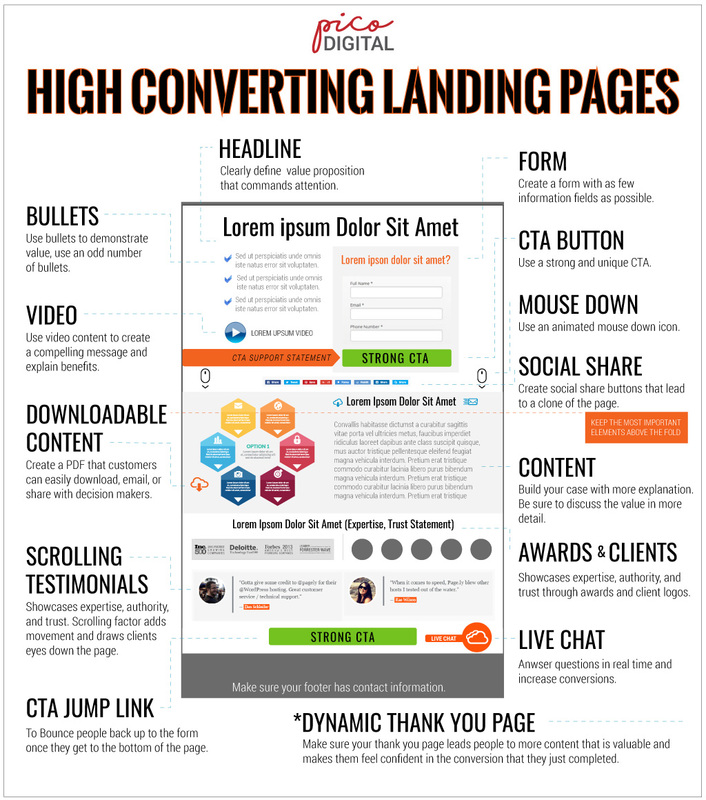 Want to download this ‘high converting landing page guide’ as a PDF? – Click here. For whom are you creating this landing page? Focus on getting inside the minds of the buyer persona for which you are building the page. Are they decision makers or merely researching to bring back to a higher up at their company? 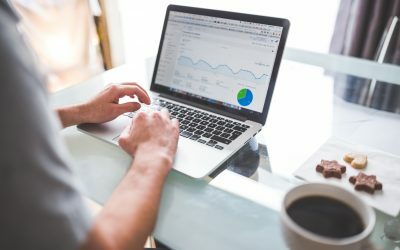 How much time do they have to engage with your page? Are the largest segment of visitors coming to your page via mobile, desktop, or tablet devices? Get into the mindset of your potential customer segment to entice customers into your sales funnel and educate them into taking a specific action as seamlessly as possible. Ensure that the relevance of your landing pages speaks directly to your target customer. Try creating several slightly different landing pages, each targeted to a segment of your audience. Before you start designing you will need to determine the goal of your landing page. Create a beautiful first impression with straightforward page design. People form their first impression in 1/20th of a second! Thus a well-designed landing page is critical to the performance of your marketing campaigns. Here are a few design tips. Your most prominent messaging should be the first thing you see on a landing page. It should be immediately evident what items are the most important and which are secondary. Utilize clean, crisp fonts that align with your brand standards. Compelling copy that is easy to read, understand and explains your product or service quickly. The first thing a visitor should see is a clearly defined short and to the point value statement. Simple, informative, and to the point. Bullet points of reasons to convert and addressing pain points are great subjects to showcase. Keep your CTA clear immediate and actionable. Taylor your CTA according to which stage of the buyer’s journey your customers are on. Make sure it demands, and the phrase is definitive and authoritative. It needs to tell the reader exactly what to do. Use testimonials, awards, and messaging that tells the customer why your company is the best choice for the challenge they are looking to solve. Make sure people can share your page easily to their emails, social pages, and download the content to show to a colleague or decision maker in their organization. Showcase in a chart or infographic, why your product or service is better than that of your competition. This way a customer will not have to leave your website to evaluate his or her options. Take a step back and review your landing page as a whole experience, does it lead the user now a natural path to conversion, is it easy to understand, is it compelling both visually and through content? Whether you choose to segment your audience into an A/B test of slightly different landing pages or learn what is working well from a heatmapping analysis, gaining data about your page is essential to improving conversions. A scrolling CTA has been shown to improve conversions. Some clients see increases well above 100% depending on their product, service and industry and the historical state of their landing page experiences. Add a scrolling CTA to a non-intrusive place on the page and have it follow the user through their experience. CTA placement is a big piece of the puzzle and a scrolling CTA cannot be ignored because it stays put during your scroll. As long as your site meets Google’s standards in all other aspects and the scrolling, CTA does not slow down your page responsiveness. Scrolling CTAs provide a subtle nudge to your visitors that’s not as aggressive as a pop-up ad.